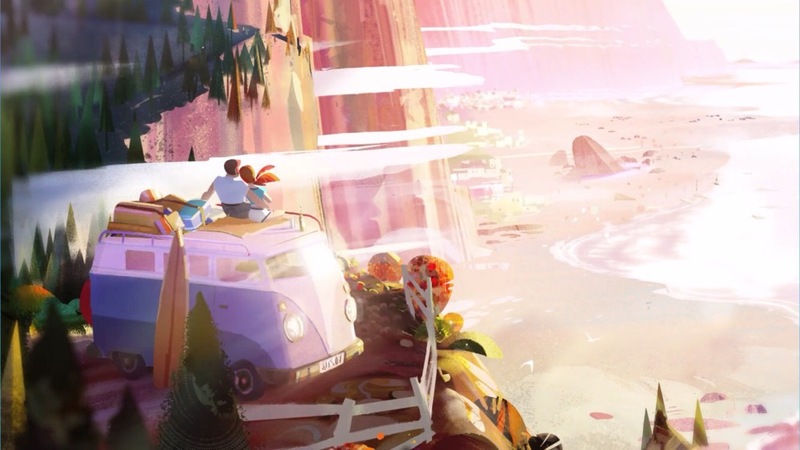 I’d been looking forward to Broken Rules’ Old Man’s Journey ever since I saw some early screenshots and teaser videos of it. As an adventure fan and a sucker for eye candy, it’s hard not to get excited about games that look like playable art. And I’m happy to report that it’s every bit as gorgeous as I’d hoped, with the entire game feeling like you’re inside a painting. And what’s more, the puzzles tie into the story and art style well, instead of being tacked on. The game starts of with a mailman delivering a letter to an old man who lives on the edge of a cliff by the sea. We aren’t shown what’s in the letter. All we know is that it’s important enough to set the old man off on a journey immediately. He grabs his backpack and walking stick and heads out. It’s obvious he has a clear destination in mind, but we won’t know what that is until he arrives. Some more astute players might be able to figure it out sooner, but for the most part we’re kept in the dark, helping the old man travel ever onward while being fed little bits of story along the way. To control the bearded protagonist, you simply tap where you want him to move and he’ll walk there as long as there’s a clear path for him to do so. This is where the puzzle part of the game comes in. Your goal is to keep him moving forward, overcoming all obstacles in his way. There’s no tutorial, but if you mess around, you’ll see that you can grab pieces of the landscape and drag them up and down so that they form a continuous path for him. The rolling hills are also a great metaphor for the ups and downs of the story, which I’ll talk more about later. If you try to grab something, the game outlines all the pieces for you so you can see whether or not they connect. The catch is that you can’t move the section that he’s standing on, so he can get in the way if you’re not careful. On my first play-through, that very specific detail became my nemesis and something I had a hard time getting used to. This was partially my fault. I’m a big puzzle fan, but I like to use trial and error to work through things. If you try that here, there’s no “reset” button on a puzzle and you’ll end up having to do some tedious backtracking with him until you correct your mistakes. 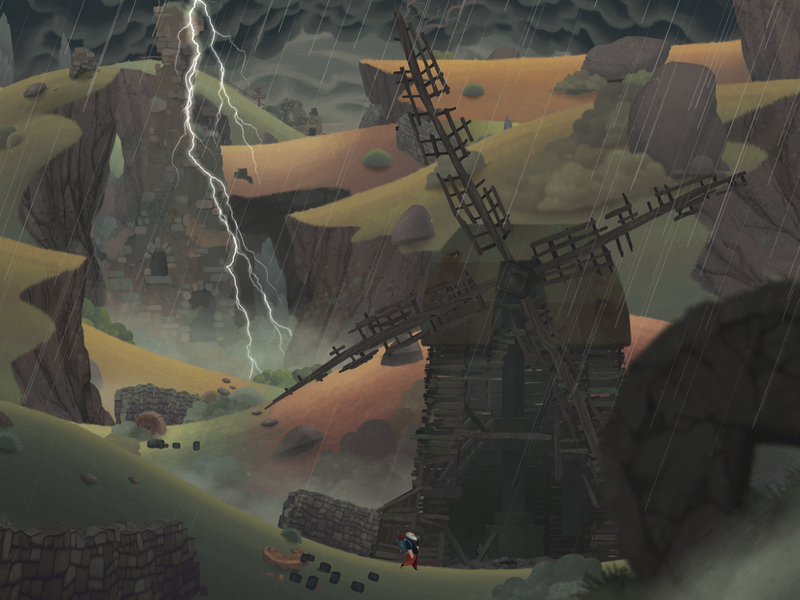 I learned this the hard way, but I think the key to enjoying the puzzles in Old Man’s Journey is to take your time to mess around with the landscape and plan things out before making any moves. Things start off simple, with just rolling hills to cross. But soon enough, new mechanics get thrown in. Thankfully, nothing ever gets overly complicated and there’s just enough variety to keep things interesting and get you through the story, without the mechanics becoming stale. 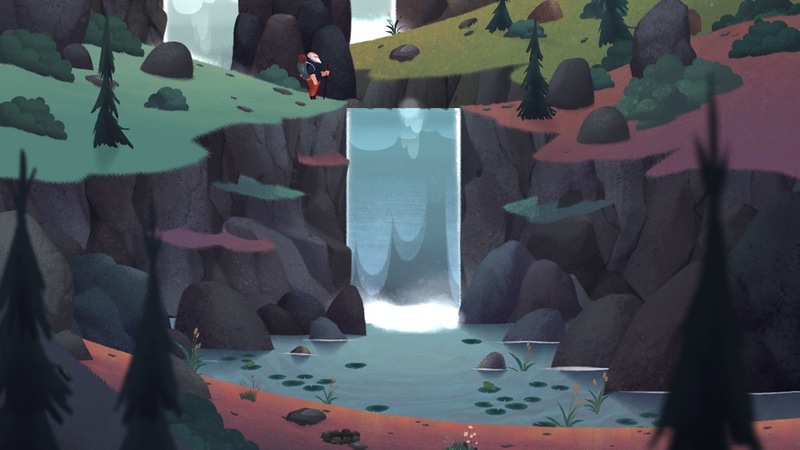 For instance, waterfalls stop him from crossing from one side to the other, but they can help you drop him down to a lower platform. Then there are wheels that you need to roll down a hill to break down a wall that’s in his way. And perhaps the best puzzle mechanic is the sheep that block his path. They can only move between grassy patches and the old man can’t go through them. So you need to tap them to get them to move around and out of his way. As long as I took my time to think it through, I found those puzzles to be the most enjoyable and often the trickiest. There’s no fail state and there’s no timer, so you can work on a puzzle for as long as you’d like. None of them are so difficult that they should stop players from finishing the game. It’s more a danger of the puzzles becoming tedious if you rush into them and try to solve them through trial and error, without planning things out ahead of time. This is an old man, so he understandably walks slowly. You need to come down to his speed and try not to rush. Don’t make him run all over the place because you didn’t take the time to think things through. Planning out your path ahead of time will save both you and him frustration. 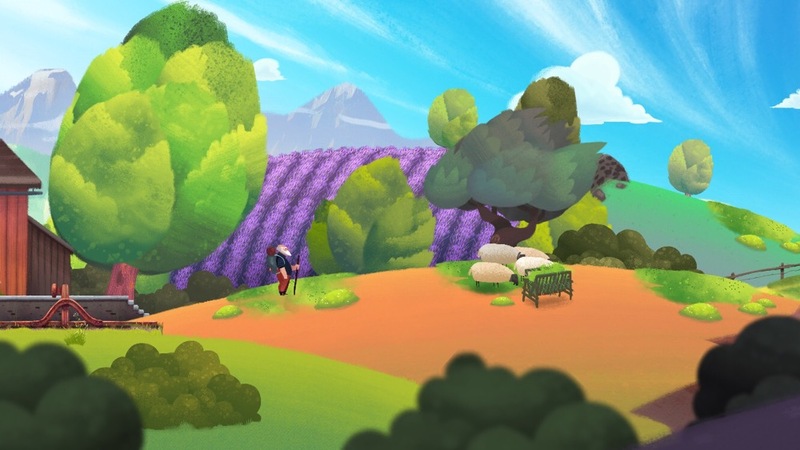 As you make your way through this colorful world, you can interact with the environment to see some bonus animations. Swiping your finger through waterfalls will create patterns in the running water and can be a very relaxing diversion from a tricky puzzle. Tapping on trees makes the leaves rustle, opening a door might make someone pop out, and touching birds will make them fly off. These are all fun to play with, but sometimes it’s actually necessary to tap on something in order to progress. For instance, the old man stops to rest on benches throughout his journey and thinks of memories brought to the surface by his surroundings. But he’ll just sit there and rest on his bench forever if you don’t tap the right object — say, a bell — to get him moving again. This might confuse some, but it’s a nice feature because it allows you to spend as much time taking in the view as you’d like. But if you rush too much and miss things that you can play around with — like croaking frogs — don’t worry about it, because the game allows you to go back and replay any of its fifteen levels whenever you want. I always appreciate that in adventure games, especially those with pretty artwork I may want to revisit. 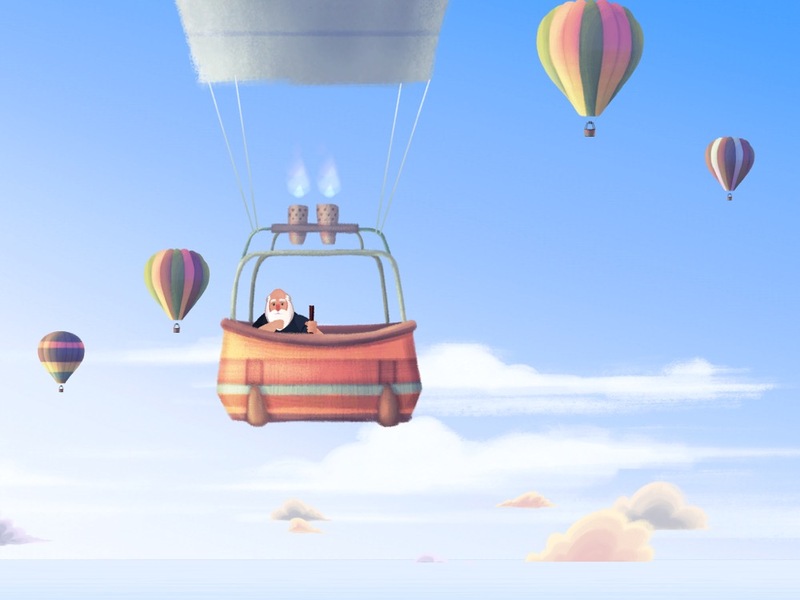 The story in Old Man’s Journey is not told through text or dialogue. As mentioned earlier, the elderly traveler rests his feet by sitting on benches and taking in the views. What he sees reminds him of specific moments in his life. We learn his story through these memories. My understanding of it is that he’s an explorer at heart and always had trouble balancing his family life with his wanderlust. I don’t want to give away the whole thing, but it’s very down-to-earth and relatable. It’s a very human story with a likable but flawed protagonist. He has to live with all the choices he made. They left him with some happy memories, but also painful ones. Even though we learn about him through images without any words whatsoever, I felt for this man, could empathize with him and was genuinely moved by his story. The game uses a different art style for his memories. It’s more painterly, what one might usually expect from concept art. But even though the memories aren’t interactive and are of a specific moment in time — almost like a photograph — they’re dynamic and full of life. They’re what you might wish the iPhone’s Live Photos were like. They even have a parallax effect and rock a bit, as though you’re on a boat — which is very fitting for a story about a man whose sailboat is his most prized possession. And once again, the game lets you take as much time as you need with these images, as they only disappear on your command. I tend to rush through games normally, but found myself spending a surprisingly long amount of time dwelling on each of his memories. They’re almost hypnotic, even when they’re unhappy memories. Believe me, the screenshots don’t do them justice. It’s amazing how subtle they are while still being so effective. 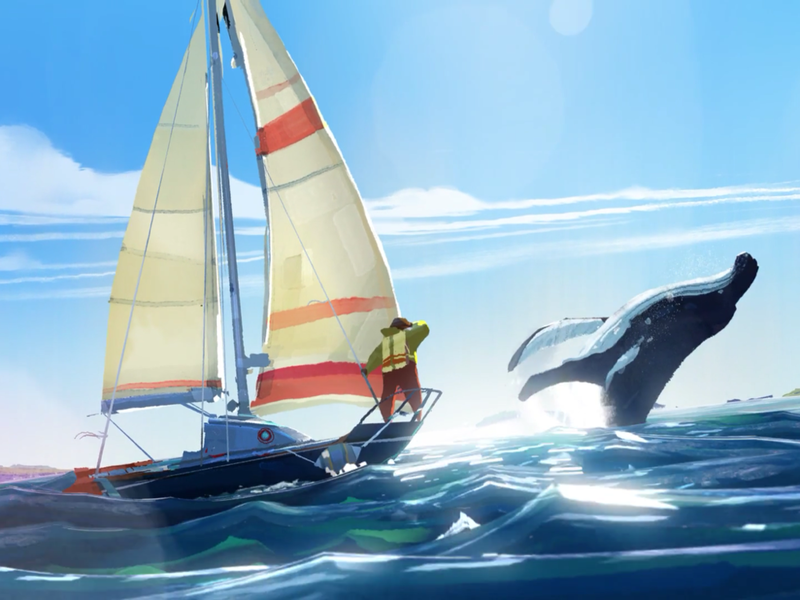 On top of all the gorgeous artwork and meaningful story, there’s also a terrific soundtrack that fits the game perfectly. It’s upbeat and adventurous when needed, with the the train track (hehe get it — train track? Ok I’ll stop) being my absolute favorite. You can hear it near the end of the video below. It’s gotten stuck in my head a few times already. It even seems to change based on the speed you’re lining up the tracks, but I think that’s just my mind playing tricks on me. The developer told me that all the music changes based on where you are in the scene, so it’s not just playing on a loop. That could be what leads to the effect of seeming like you actually controlled the pace of the music. And since the game is not always upbeat, the music is dark and haunting when necessary, but never depressing. I highly recommend keeping the volume up and giving the game your full attention. Oddly enough, I enjoyed the game more on my second time around. I think that’s because I finally learned to slow down. Usually a puzzle game is boring the second time because I already solved everything and am just going through the motions. 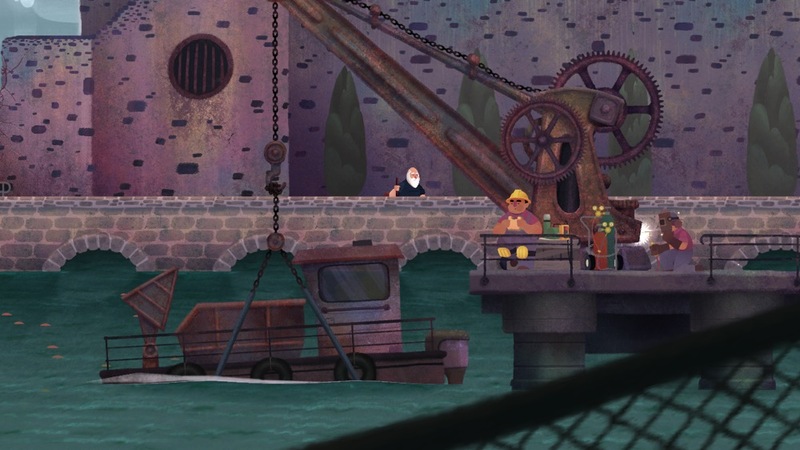 But I had a greater appreciation for Old Man’s Journey on repeated play-throughs. I was able to mitigate frustration by only moving the protagonist when I was sure the path was ready for him, so I spent less time juggling him around. I was also paying closer attention to all the little details and what actions triggered each progression, so I could soak in each scene and play around with the environment. The game does have a few small issues, though. It suffers a bit from the fact that you’re using the same commands for everything. Sometimes it doesn’t differentiate between me just playing around with the environment — like a windmill — and walking or adjusting the landscape. It will move the landscape or the old man even when I don’t want it to. For instance, I might tap on a door or window to see if it would open and the game thought I wanted to move him there. I’m not sure how that could be fixed, but it does lead to occasional frustrations and possibly missed experiences if you stop playing with things just to prevent accidental movements. The ending also felt a little rushed and perhaps even a copout, but I can’t talk about that without spoiling it. And another very minor issue might be a problem for those who either play in a public space or just don’t like the soundtrack. There is a mute button in the settings, but it shuts off all sound, not just the music. And you do need to use it if you don’t want to hear the music, as the game ignores your device’s mute toggle. But the soundtrack is all part of the package and this is a game that should be played in a relaxed setting, anyway, not between conference calls. So it isn’t a huge problem for this type of game unless you really don’t like the music for some reason. Sadly, there’s no iCloud sync here, which is a real shame. It’s one of those games that plays perfectly well on an iPhone but is best on an iPad in your lap. You’re also able to go back to any levels you completed, instead of just playing through it and deleting. It would have been nice to have the ability to replay any level on any device without having to play through the whole thing again — though I have completed the game on both iPhone and iPad. Also, it’s a big game, so it might be hard to justify keeping it on your device if you have little space. iCloud would have allowed you the option to install it on a whim just to play a specific level. It’s not a quick game to run through, even if you memorized the puzzles already. So iCloud would have been a very welcome feature. 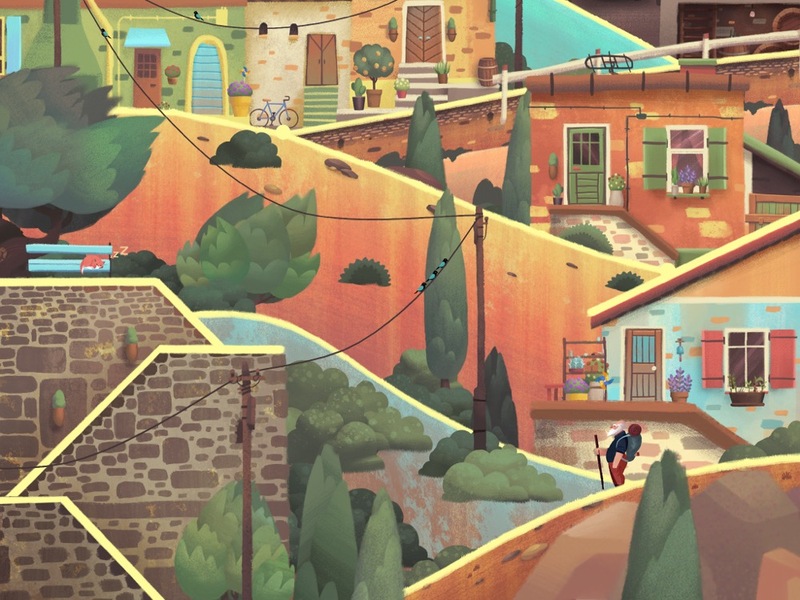 As much as I enjoyed Old Man’s Journey, I’m aware it’s not going to be for everyone. If you’re looking for something fast-paced or skill-based, this is not it. As far as puzzles go, it has some tricky moments, but this is no Snakebird. There aren’t a ton of puzzles, either — just enough to keep things varied and progress the story. Although they’re interesting puzzles, I wouldn’t have wanted a hundred of them, so I’m glad the developers didn’t stuff the game with filler just to make it longer. If you’re looking for a challenging game to keep you occupied for a long time, this isn’t it. You have to be in it for the artwork, for the whole presentation and the short meandering stroll through an old man’s life. If you go in with these expectations, I don’t think you’ll be disappointed. If that sounds good to you, you can download the game here. If you’re already playing the game and need help with a puzzle, try my complete walkthrough guide.